I feel like the most authentic version of myself when I’m outside and a bit disconnected from the busyness of the day to day. When I made my move to Vermont some years ago, I found myself falling fast for the surrounding mountains and lake. Weekends were full of belly laughs, hearty food, cheap beer, and outdoor adventures. Living in a city has made me appreciate these experiences even more, and I take every opportunity I get to return to the mountains and get off the grid. This past weekend I retreated to The Hacienda, a tiny mountain cabin in New Hampshire off the beaten trail. We were invited by my good friend Emily, a travel blogger, fellow UVMer, total foodie, and wonderful adventurous spirit. Catching up with Em is always comforting, motivating, and inspiring. We went for a long walk and talked about our crazy dreams, float n’ soaked in the pond, cooked great food, and shared lots of good laughs around the table with the best people. On Saturday morning we made a big breakfast of 'rustic rancheros,' a hearty mix of black beans, spicy sausage, eggs, and vibrant veggies. 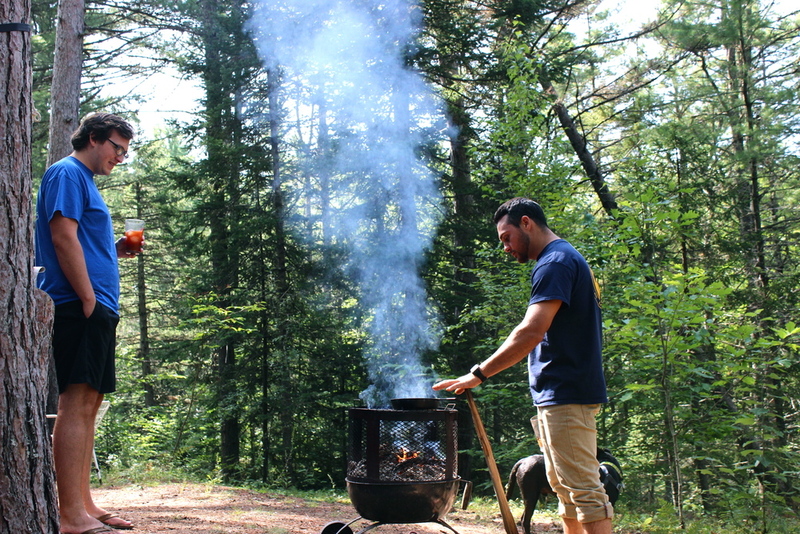 We cooked outside surrounded by pine trees and blue sky, blistering cherry tomatoes, grilling sausages, and charring corn tortillas over the fire. We diced, dashed, and grilled, sipping on bloody mary's all the while. This meal is simple, satisfying, and imperfect. It was a hit with the cabin crew, winning over the very hungry men who patiently watched us take pictures of their breakfast. It's definitely a repeat meal that I'm already looking forward to making again. Eat up, and enjoy the outdoors these last few weeks of summer :). *We had a wood fire with a grill top going, but these could just as easily be thrown together using a traditional grill or your stove top. Once your heat source is hot and ready, place the olive oil and diced onion in a pot. Heat until onion is soft and translucent. Add black beans to pot and stir. Add cayenne pepper, 1/4 cup greek yogurt, and salt and fresh ground pepper to taste. While the beans are cooking, place chicken sausages on the grill top as well. Rotate periodically to cook evenly. Remove the beans from heat once they have heated through entirely to avoid any burning. Cover with foil or lid to keep warm. Throw your halved cherry tomatoes in a cast iron skillet and cook until charred and blistered. While your tomatoes are cooking, fry eggs in a skillet, watching closely to be sure you remove before the yolks cook through. *I love runny yolks, but cook longer if desired. Remove the sausages from heat, dice, and set aside. Remove tomatoes from heat when blistered. Meanwhile, throw the corn tortillas on the grill top and char desired amount, flipping to heat both sides. Assemble rancheros by piling your tortillas high with beans, sausage, cheese, tomatoes, greens, an egg and avocado slices. Top with a dollop of greek yogurt, hot sauce, and salt and pepper to taste.